Leslie Linkkila & Philip DiNuovo have been cruising since 2003 aboard Carina, a PAE Mason/Mason 33/33’9” hailing from Kingston, WA, USA. 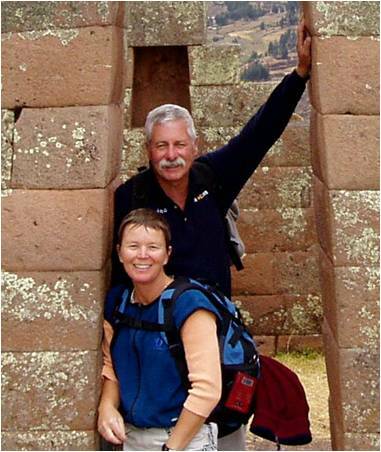 Over those years they have traveled through Mexico, Central America, some of Pacific South America, South Pacific and you can read more about their travels on their website and they can be contacted via email (philipandleslie@sv-carina.org). When we had a near rigging failure in remote Panama, we wished we had more rigging spares: Sta-Lok fittings, wire rope, etc. We’ve rectified that situation and feel we have the right amount of spares of just about everything. Engine parts are important to stock in as are sail repair and canvas supplies. We wished we could have stayed longer in South America in general and had been able to visit Peru and Chile in particular. We may still get back there. Friends told us that we should give away or sell most everything we owned - our accumulated stuff – since its importance would quickly diminish once we were cruising. They said that we would not even remember what we had or why we kept moving it around with us. They were right. The other thing we were told is that it will cost more to cruise than you would ever think. They were right about that, too. There is not much we dislike. Even so, with storage space at a premium, it seems that the tools, parts, etc. that we need are always at the bottom of the storage spaces and we are constantly unpacking and repacking. We knew we would be living in close quarters and limited in our ability to buy “stuff” but that’s part of the appeal, to live more simply but even more richly. We have had fewer visitors than we thought we would have. Les’s family has visited twice, as has one friend. Most friends are busy with their careers and vacation time is limited. Too, now we are so very far away from most of our friends, so visiting is more costly and difficult. Cruising costs more than most people think since they tend to not include the cost of maintaining their vessels while out here. They also don’t factor in capital expenditures like rebuilding or replacing your engine, replacing a stolen dinghy and outboard motor, re-certifying your liferaft, replacing sails, boatyard visits, etc. We would estimate that we spend about $24k per year including all of the capital expenses. We live incredibly well on this amount of money but we don’t frequent marinas and we rarely dine out because we enjoy cooking (using fresh local ingredients) and eat healthier at home. We maintain a watch day and night. We remember being on a long cruise and enjoying breakfast in our cockpit one day when we noticed a small freighter heading directly towards us. We made a course change and the vessel passed to our port about 100 meters away; the boat was on autopilot and we could see no one in the wheelhouse. Had we not been keeping watch, we could have had a collision with this boat hundreds of miles from any other boat. During the day, the watch schedule is flexible, depending on chores to be done such as cooking/baking or email/weather/radio nets, or a need for rest, etc. After supper, a three on-three off schedule commences for a period of roughly 13 hours. The 13 hours is because of the time needed to change watch is not counted in the off-watch time. It takes time to make tea, plot our position, discuss weather, hazards, etc. The new three hour watch begins when the off watch physically climbs into the bunk. We find trading is often difficult because the people we see are often pretty needy so we are somewhat uncomfortable asking for their food. We DO trade, especially if the locals are trading food they have in excess: fish, oranges, bananas, papayas, etc. but then we always give more in the end. Traded or donated goods include powdered milk, powdered cocoa, fishing line, fishing hooks, snorkel equipment, T-shirts and other clothing, rice, canned goods, etc. Individually-wrapped chocolates such as Hershey Nuggets are a real hit for both children (and grownups!) and we have fun watching their faces light up as we give them out. We can’t say we made too many compromises along the way except for decisions as to which direction to point our bow. We were comfortable with the choice of NOT heading north through the Panama Canal into the Caribbean since that would have entailed about 2 years of cruising in an area of the world we were less interested in. asked you and how would you answer it? We stressed a bit before leaving the US wondering what we would do for health care/insurance. For the first 3 years of cruising we even paid a LOT of money for catastrophic health coverage and got not a single penny of benefit. What we found in most second and third-world areas is that the cost of health care and prescription drugs is a small fraction of the cost of that in the US and self-insuring makes sense. Not only are the health care professionals comparable to those in the US, many have been educated in the US and have returned to their home countries to practice medicine. What we paid for health insurance for the first three years of our cruise could probably pay for open heart surgery in The Republic of Panama. We now pay out of pocket for our medical care.